Marvelous Multiagers! : Done with Week 4! Moving on to better things, this week we discussed 9/11 and Grandparents' Day. I'm glad they coincided because it was going to be a tough week without Grandparents' Day. When I brought up 9/11, none of my students had ANY idea what I was talking about at all. So I showed them the 9/11 BrainPop video to give them an idea. Then we colored a sheet I got from First Grade is Fantabulous. 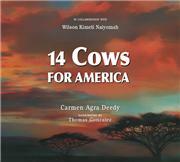 The second day, I read 14 Cows for America. I had to paraphrase many of the pages because the words were really over their heads. But I think they got the main idea. Then I made a little PowerPoint about the Maasai tribe and we watched a Youtube video of them singing and dancing. The kids really liked it a lot! A lot of them said it was their favorite part of the day. I also had a student tell the class that she is part Maasai and that she had been to the place where they keep the sacred cows. Needless to say.... she is 100% Caucasian American. Has anyone else encountered a student who makes up blatant stories? She does this a lot and never about actual important things - only things like this, or that she speaks a different language. Weird. Anyway, for Grandparents' Day, I sent home a family tree and the families filled them out. Then, my favorite next-door neighbor teacher helped me make a big tree to display them on in the hallway!! I also had the students bring in pictures of their grandparents to share. About half of the students brought in pictures. But it was awesome for the kids to hear each others' stories and practice asking questions. Before we shared pictures, I read Who's Who in My Family? 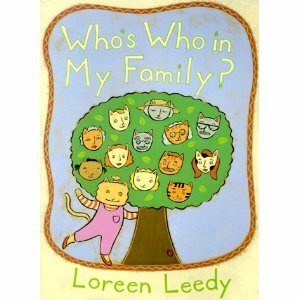 This was a really cute age-appropriate book about family trees and families in general. It talked about the nuclear family as well as grandparents, great-grandparents, great-aunts and uncles, and blended families. It also discussed adoption, which only one of my students had ever heard of. And last, but absolutely not least, my library finally ordered Pete the Cat for me!!!!!! I am soooOOOooo excited to read this on Monday! I'm planning on using lots of ideas I've seen in blogs to accompany it. Yay!!! Thanks for the comment about Adventure to Fitness. Was your state listed?? I can't seem to get past that to the part that you're talking about. Thanks for sharing the book! So glad my library has it- we're studying families in two weeks. My kinders LOVED Pete... he will save any grouchy, rainy, or crazy day.